Do you remember The Golden Saucer? In the waning hours of Final Fantasy VII, as our hero Cloud and his friends prepare for a huge showdown with the villainous Sephiroth, this magical play land opens its doors and gives our world saviors a place to blow off some steam through playing mini-games and earning prizes. Mostly, it was used for racing and breeding Chocobos, but other fans might remember a wonderful little mini-game that featured a hero fighting off enemy soldiers while riding on a bike. 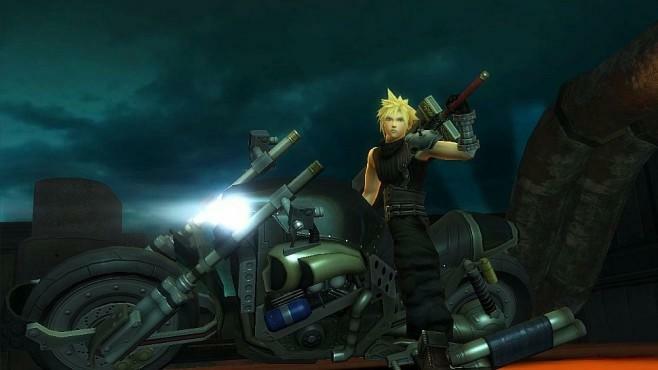 It’s here that we find the latest Final Fantasy VII spin-off to hit Japanese smartphones. Final Fantasy VII G-Bike, a huge remake of the classic mini-game from CyberConnect2, launches today for Android and iOS in Japan. I’m downloading it to my HTC One as we speak. Our hero Cloud peels onto the Midgar highways once again in this endless runner, only the graphics have given a major overhaul and it is more than just enemy soldiers who he must fight. His childhood love-interest Tifa has been seen in trailers aiding him in his flight by providing a limit break attack, but Japanese video game magazine Famitsu also confirms that his foul-mouthed pilot friend, Cid, will come in times of need. Sounds exciting! Square Enix has had mixed results with the move into the mobile market. Most fans have trouble accepting their mobile ports of classic favorites and can’t forget infamous spin offs like Final Fantasy IV: The After Years and Final Fantasy: All The Bravest. Others hold a few original titles like Chaos Rings and Rise of Mana in high regard. With a decent developer like CyberConnect2 involved, perhaps this will be another one to help clean up its image. If it’s a success, maybe they will get the team to remake the snowboarding mini-game as well!